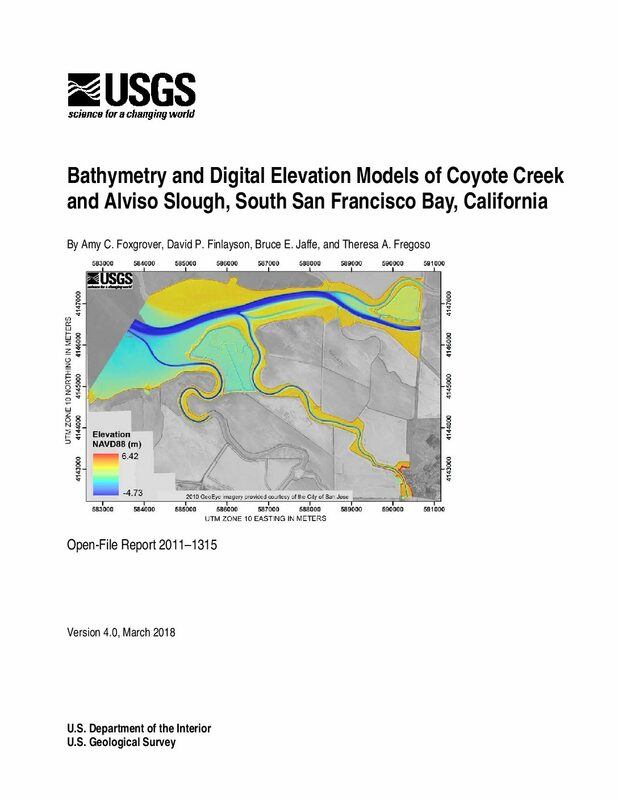 In 2010 the U.S. Geological Survey (USGS), Pacific Coastal and Marine Science Center completed three cruises to map the bathymetry of the main channel and shallow intertidal mudflats in the southern most part of south San Francisco Bay. The three surveys were merged to generate comprehensive maps of Coyote Creek (from Calaveras Point east to the railroad bridge) and Alviso Slough (from the bay to the town of Alviso) to establish baseline bathymetry prior to the breaching of levees adjacent to Alviso and Guadalupe Sloughs as part of the South Bay Salt Pond Restoration Project. Since 2010 the USGS has conducted twelve additional surveys to monitor bathymetric change in this region as restoration progresses. Strategic retirement and restoration of agricultural lands is a critical conservation opportunity globally. The objective of this synthesis was to examine whether ecological habitat assessments, endangered species historical occurrence data, and restoration research can be used to develop evidence-based strategy for retiring and restoring agricultural lands. The San Joaquin Desert (SJD) of California is a prominent example because it experienced an extensive conversion to agriculture. Now, new groundwater regulations will lead to retirement on large areas of agricultural lands over the next 20 years. This presents an opportunity to not only restore some of these lands but also explore the challenges associated with balancing direct human needs with other ecosystem-level functions. California is thus an ideal case study for globally rethinking context-specific, single-case study solutions. We used a systematic review and synthesis to address the following three main questions for habitat recovery of endangered species in the SJD. (1) What are the habitat requirements for key endangered animal species in the region? (2) Is there historical evidence to support an assessment of suitable habitats for these species? (3) What restoration techniques apply to these species? Using the Web of Science and other resources, we reviewed over 1000 independent studies on this topic, refined the evidence, and selected a total of 266 relevant publications. Habitat requirements for each species were described, but there was a critical need to examine quantitative thresholds for these factors to better evaluate habitat suitability of retired lands. There was sufficient evidence of historical vegetation to model suitable habitats and design the physical restoration of retired lands. Direct interventions associated with restoration strategies have been infrequently tested. Sparse and diverse evidence associated with direct experimental manipulations is not uncommon in applied ecology, and synthesis is an excellent tool for highlighting these gaps for future research to examine. 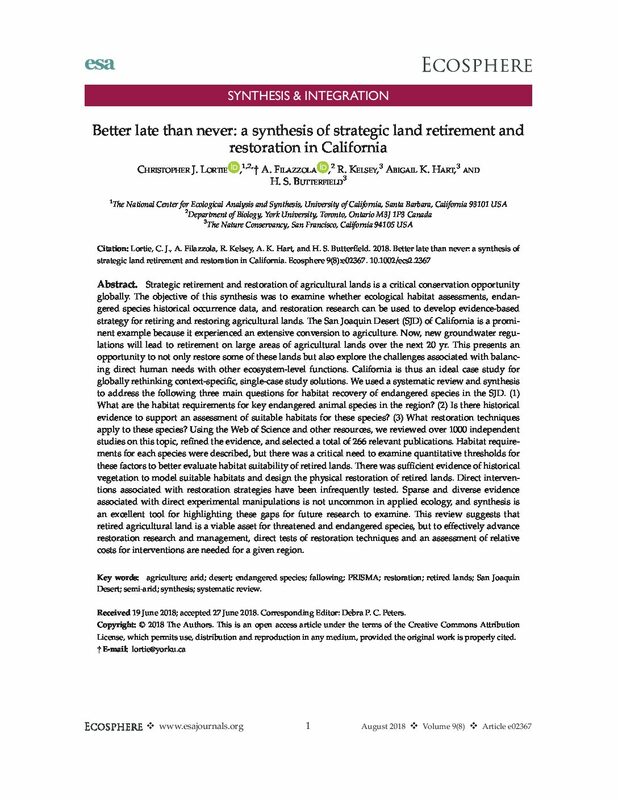 This review suggests that retired agricultural land is a viable asset for threatened and endangered species, but to effectively advance restoration research and management, direct tests of restoration techniques and an assessment of relative costs for interventions are needed for a given region. For over 50 years, California has been pumping water through the Sacramento-San Joaquin Delta for extensive urban and agricultural uses around the state. Today, the Delta is ailing and in urgent need of a new management strategy. 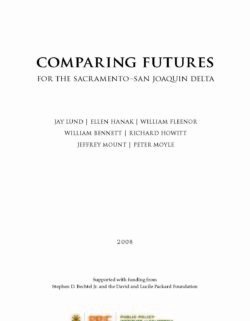 This report concludes that building a peripheral canal to carry water around the Delta is the most promising way to balance two critical policy goals: reviving a threatened ecosystem and ensuring a reliable, high-quality water supply for California. The Conservation Strategy describes ERP goals and conservation priorities for Stage 2 of the CALFED Bay-Delta Program (CALFED) and was developed by the Department of Fish and Wildlife (CDFW) in coordination with the United States Fish and Wildlife Service (USFWS) and the National Oceanic and Atmospheric Administration Fisheries Service (NOAA Fisheries), collectively known as the ERP Implementing Agencies. 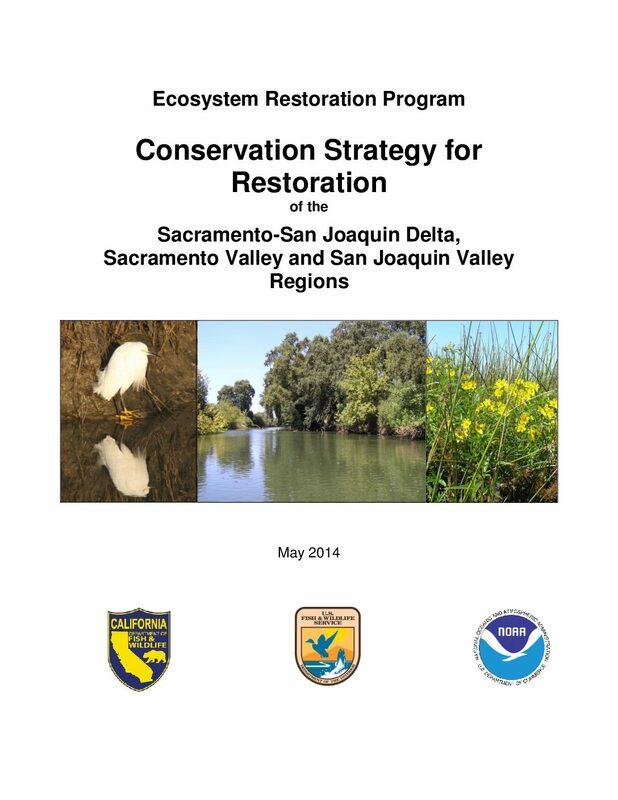 This document serves as the conceptual framework that will guide future ERP environmental restoration, including development of conservation priorities and processes to identify and implement restoration opportunities, and monitoring to guide and improve its success in the Sacramento-San Joaquin Delta (Delta), and the Sacramento Valley and the San Joaquin Valley regions. 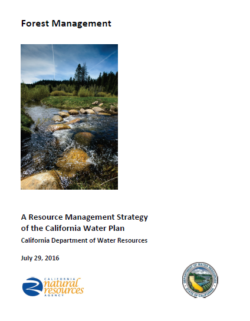 This Conservation Strategy builds on information presented in the Ecosystem Restoration Program Plan (ERPP) (CALFED 2000a), the Multi-species Conservation Strategy (MSCS) (CALFED 2000d), ERP Milestones Reports (CALFED 2001b) and Annual Reports (DFG 2011b), the best available science on current ecological conditions, related programs and planning efforts, and input from stakeholders and the general public. 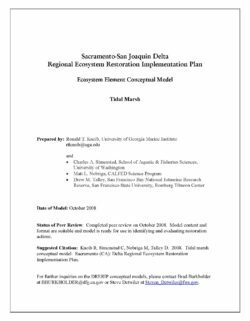 There are many different kinds of conservation planning currently underway for the Delta, Sacramento and San Joaquin Valley regions and restoration is very much a shared vision between and among the agencies, various resource users, and the public. ERP Implementing Agencies will be using this ERP Stage 2 Conservation Strategy as a guide through the end of Stage 2 (2030). It provides a comprehensive ecosystem restoration strategy for ERP efforts in the Focus Area (Focus Area) (Figure 1), allowing flexibility in adapting responses accordingly to new scientific findings, changed circumstances and new or modified future conservation priorities. This Conservation Strategy will serve as a guide to identify programmatic-level types and locations of potential restoration actions based on conservation priorities. It is not a prescription for restoration actions at any specific site. Within this strategy is a compilation of conservation priorities, articulated from lessons learned during Stage 1, which may be used to meet ERP goals. All agencies, groups, or individuals interested in resource conservation and management within the Focus Area are encouraged to use this document as a guide to help coordinate activities to address ERP conservation priorities. 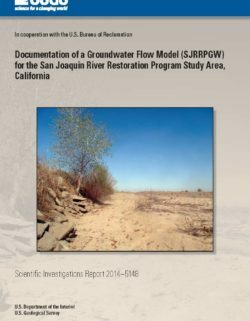 To better understand the potential effects of restoration flows on existing drainage problems, anticipated as a result of the San Joaquin River Restoration Program (SJRRP), the U.S. Geological Survey (USGS), in cooperation with the U.S. Bureau of Reclamation (Reclamation), developed a groundwater flow model (SJRRPGW) of the SJRRP study area that is within 5 miles of the San Joaquin River and adjacent bypass system from Friant Dam to the Merced River. The primary goal of the SJRRP is to reestablish the natural ecology of the river to a degree that restores salmon and other fish populations. Increased flows in the river, particularly during the spring salmon run, are a key component of the restoration effort. A potential consequence of these increased river flows is the exacerbation of existing irrigation drainage problems along a section of the river between Mendota and the confluence with the Merced River. Historically, this reach typically was underlain by a water table within 10 feet of the land surface, thus requiring careful irrigation management and (or) artificial drainage to maintain crop health. The SJRRPGW is designed to meet the short-term needs of the SJRRP; future versions of the model may incorporate potential enhancements, several of which are identified in this report. 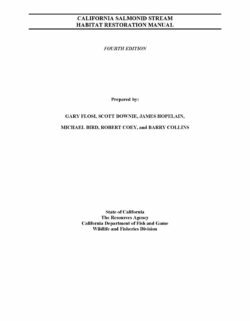 The SJRRPGW was constructed using the USGS groundwater flow model MODFLOW and was built on the framework of the USGS Central Valley Hydrologic Model (CVHM) within which the SJRRPGW model domain is embedded. The Farm Process (FMP2) was used to simulate the supply and demand components of irrigated agriculture. The Streamflow-Routing Package (SFR2) was used to simulate the streams and bypasses and their interaction with the aquifer system. The 1,300-square mile study area was subdivided into 0.25-mile by 0.25-mile cells. The sediment texture of the aquifer system, which was used to distribute hydraulic properties by model cell, was refined from that used in the CVHM to better represent the natural heterogeneity of aquifer-system materials within the model domain. In addition, the stream properties were updated from the CVHM to better simulate stream-aquifer interactions, and water-budget subregions were refined to better simulate agricultural water supply and demand. External boundary conditions were derived from the CVHM. The SJRRPGW was calibrated for April 1961 to September 2003 by using groundwater-level observations from 133 wells and streamflow observations from 19 streamgages. The model was calibrated using public-domain parameter estimation software (PEST) in a semi-automated manner. The simulated groundwater-level elevations and trends (including seasonal fluctuations) and surface-water flow magnitudes and trends reasonably matched observed data. The calibrated model is planned to be used to assess the potential effects of restoration flows on agricultural lands and the relative capabilities of proposed SJRRP actions to reduce these effects. Tidal marshes are a subset of estuarine wetlands defined by the presence of emergent vegetation types uniquely adapted to sheltered intertidal zones of temperate and subtropical coastal plains (Chapman 1960, 1976, Mitsch & Gosselink 1993). They are found across a full range of salinity conditions from seawater on the immediate coast to freshwater tidal reaches of estuarine river systems. Marshes are transitional ecosystems that provide critical connections between adjacent subtidal and terrestrial ecosystems within the estuarine landscape (Simenstad et al. 2000; Levin et al. 2001). These “critical transition zones” often function as conduits for substantial fluxes of materials and energy (Ewel et al. 2001), and provide a variety of valuable ecosystems functions, goods and services related to the maintenance of biodiversity, fish and wildlife habitat, water quality, flood abatement and carbon sequestration (Rabenhorst 1995, Costanza et al. 1997, Weslawski et al. 2004, Zedler & Kercher 2005). However, estuarine marshes and the biotic communities that depend on them are vulnerable to both direct and indirect anthropogenic impacts (Holland et al. 2004, Snelgrove et al. 2004), and the functionality of these systems can be difficult to restore once severely impacted (Zedler & Kercher 2005). The San Francisco Bay and Sacramento-San Joaquin River Delta estuary is perhaps the most hydrologically-engineered estuarine wetland system in the United States, and an estimated 95% of the marsh area that existed there in 1850 has been altered or converted to other land uses (Josselyn 1983). The principal source of freshwater input to the estuary enters through the Sacramento and San Joaquin rivers; their inland delta (the Delta) is the terminus of a watershed that drains about 40% of California’s land area. Anthropogenic alterations of the estuary’s hydrologic characteristics have profoundly affected the extent and functioning of the tidal wetlands, particularly in the brackish and tidal fresh portions of the upper estuary associated with the Delta. Although the conceptual model presented in Figure 1 is intended to capture the features and dynamics of tidal marshes in the Delta (e.g., Suisun Bay to the upriver extent of the tides in the Delta), oligohaline and tidal freshwater marshes generally remain poorly understood. Recent texts (e.g., Sharitz & Pennings 2006) still consider the review by Odum (1988) as the best treatment of these low salinity tidal ecosystems. Consequently, development of the current conceptual biological model often required us to judiciously borrow from the more extensive literature on temperate salt marshes in diverse regions. Although one of our principal objectives in developing this model involves identifying the dominant processes and interactions that characterize restoring marshes at various stages of development, the model is intended to characterize the dynamics of “equilibrium” marshes at their mature state of geomorphic and ecological functioning (Pestrong 1972, Reed 2002, Williams et al. 2002). Our rationale is that restoring marshes are considerably variable and that trying to capture intermediate stages of development (e.g., positions along a development “trajectory”; Simenstad & Thom 1996 [however, see Zedler & Callaway 1999]) would introduce too much variability for a single model, and because the ultimate objective of restoration is the self-sustaining, equilibrium condition. 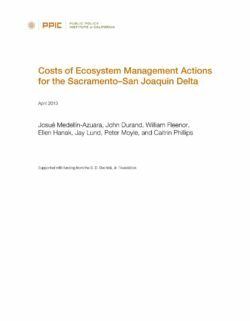 However, we have sought were appropriate to describe important processes that influence restoration trajectories and affect the ecosystem functions, goods and services that marshes provide in various landscape settings that are found in the Sacramento-San Joaquin Delta. 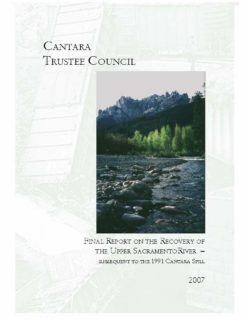 The Cantara Trustee Council (CTC), and the Cantara Program, operated for a period of 12 years, from 1995-2007. During that time, the CTC funded numerous projects which included restoration activities, land acquisition and protection, research, and public education. The purpose of this document is to leave a summary record of events that occurred due to the 1991 Cantara spill. It is our intent to provide a condensed presentation of the spill event, the legal processes following the spill, including the formation of the CTC, the formation of the Cantara Program, and the development of guiding plans and documents used by the CTC in the disbursement of settlement funds. Forest lands in California, the majority of which are in the middle to high elevation foothills and mountains, produce a diverse array of resources such as water, timber, native vegetation, fish, wildlife, and livestock, and outdoor recreation. However, the water produced by these forests has economic value that equals or exceeds that of any other forest resource (Krieger 2001; California Department of Forestry and Fire Protection 2003). Most of California’s major rivers and a substantial portion of its runoff originate in these forests; therefore, most of California’s major water development projects are tied strongly to forested watersheds. Forest management activities can affect water quantity and quality. This strategy focuses on forest management activities, on both public and privately-owned forest lands, whose goals specifically include improvement of the availability and quality of water for downstream users.